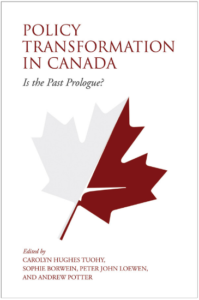 Policy Transformation in Canada: Is the Past Prologue? Tracing the past, present, and future of Canadian policymaking, Policy Transformation in Canada examines the country’s current and most critical challenges: the renewal of the federation, managing diversity, Canada’s relations with Indigenous peoples, the environment, intergenerational equity, global economic integration, and Canada’s role in the world. Scrutinizing various public policy issues through the prism of Canada’s sesquicentennial, the contributors consider the transformation of policy and present an accessible portrait of how the Canadian view of policymaking has been reshaped, and where it may be heading in the next fifty years. Edited by Carolyn Hughes Tuohy, Sophie Borwein, Peter John Loewen, and Andrew Potter, and published by University of Toronto Press. Carolyn Hughes Tuohy is professor emeritus of political science and founding fellow in public policy at the Munk School of Global Affairs & Public Policy at the University of Toronto. Sophie Borwein is a PhD student in Political Science at the University of Toronto, Junior Fellow of Massey College, and the first public editor of University of Toronto’s student newspaper, a role focused on serving the interests of both the newspaper’s readers and its journalists. Peter John Loewen is professor in the Department of Political Science and the Munk School of Global Affairs & Public Policy at the University of Toronto. Andrew Potter is a noted journalist and editor-in-chief of the Ottawa Citizen.